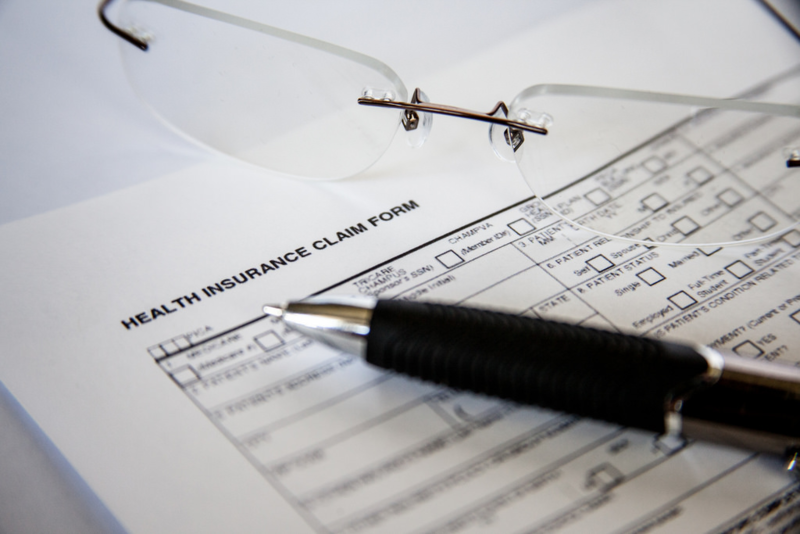 Insurance companies and the billing process can be a pain for providers and patients alike. While providers must endure unreasonable waits to receive full payment, patients often assume their bills have been taken care of, only to get unexpected “payment due” notices months after receiving care. Unfortunately, health insurance companies have all sorts of tricks and schemes they use to avoid paying the full cost, or any of the cost, of supposedly covered treatments. These unethical practices run rampant in the U.S. health insurance industry, which saw a total revenue of roughly $850 billion in 2015. Despite massive profits, insurance companies are demanding rate hikes and refusing more claims than ever. Here are some of the tricks insurance companies use to avoid claims, as well as what you can do in the face of an insurance company that refuses to pay claims. Out of- and narrow-network health plans, while generally cheaper for the consumer, often present financial challenges for those who use them. Dr. Allen Kamrava tells of how he performed a procedure on a patient at a local hospital where both he and the hospital were in-network providers for the patient's plan, however, the anesthesiologists and pathologists involved in the procedure were not. The patient ended up paying nearly three times as much as if they’d paid out-of-pocket at a nearby out-of-network outpatient surgery center. Additionally, insurance providers will bring claims against OON providers in hopes that they will simply succumb to the fears and pressures of possible further penalties. Make sure that you have viable recoupment defense ready. The Department of Labor estimates that about one in seven health insurance claims is initially denied, even though it’s completely valid. This amounts to about 200 million out of the 1.4 billion submitted each year. Reasons listed could be as mundane as incorrect diagnosis codes recorded on paperwork, to contentions that the procedure was not “medically necessary” — in fact, Consumer Reports listed “double-checking tedious information on long forms,” “ensuring that the diagnostic/procedure code is listed and is correct”, and “getting pre-authorization” as the top three ways to avoid having a health insurance claim denied. If you think insurance companies are denying your completely legitimate claims, look into professional help in claims and appeals. Patriot Group founder and President, Thomas J. Force, Esq., has made a career out of recouping money that doctors are rightfully owed by insurance companies, but don’t have the time or resources to fight for. 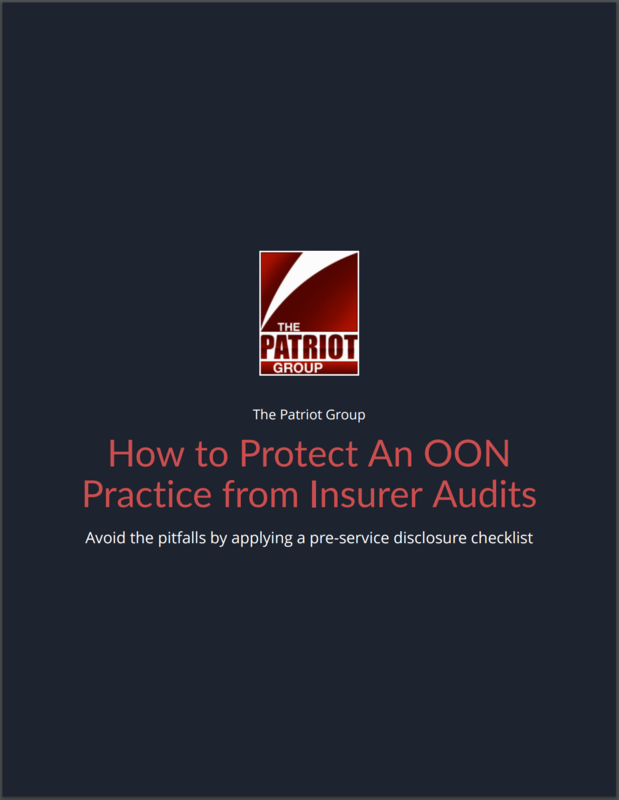 Insurance providers are constantly on the hunt to push OON providers in-network by finding some kind of crack in compliance and initiating an audit. While compliance and regulation serve a valid purpose, many OON providers aren’t exactly sure how to stay compliant. We recommend you avoid compliance issues by verifying eligibility and performing your due diligence. This means having a clear plan in place and following steps to avoid risk of an audit, such as disclosing any supporting or other physician’s name, address, and phone number whom the physician intends to refer the patient to, including anesthesia, imaging, and lab work. You’ll also have to disclose health plans the physician participates in and the hospitals they are affiliated with. Without covering these bases, you’re only opening yourself to audit, and an excuse for insurance providers to deny claims. Insurance companies are notorious for relying on the confusion of their customers to land them in hot water. The contracts are dense, and even though half of all states have “plain English” laws for consumer contracts, many still are unclear on the risks that they are subject to. ● Submit clean and completed claims containing proper modifiers and including authorization numbers on claim forms, as incomplete claims can waste resources and bog down the claim process. ● Hold insurance companies accountable. When talking to an insurance company ask for a reference number for the phone call, and ask for a higher-level employee if necessary; not everyone at an insurance company has the same abilities to help you. ● Consider filing external, independent appeals for clinical denials for lack of medical necessity. ● Don’t forget that you can always file complaints with insurance regulators (for non-ERISA Plans) and with the Health Bureau with the US Department of Labor (for ERISA Plans). When it’s all said and done, insurance companies are looking out for their bottom line first and foremost. Healthcare providers and doctors should read their policies carefully, and make strides to understand as much as they can. Keep both eyes open, take care to put everything in writing, digital or otherwise, and don’t give up on your fights — if needed, seek help from physician advocates you can trust like us. If you have any questions, feel free to contact us today. Remain compliant by using a list of patient forms and disclosures that're essential to your appeals and fraud audit defense.